College Korean offers a comprehensive introduction to the Korean language designed for American students. Rogers, You, and Richards have used their many years of teaching to devise and test an approach that balances reading and writing with the spoken language. The result is a well-rounded textbook suited to a yearlong course in which students learn to conduct conversations about their own lives and interests, read texts written in hangul, and write simple compositions. The book systematically introduces basic Korean grammar, a contextualized vocabulary, and styles of speech that are sociolinguistically appropriate for college students. Each of its 26 lessons contains a dialogue or a reading, practice patterns, relevant grammar notes, and exercises. Approximately 150 Sino-Korean characters are also introduced, and complete glossaries and grammar indexes are provided. 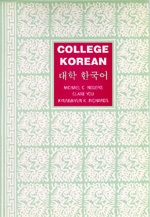 Michael C. Rogers is Professor Emeritus, and Clare You and Kyungnyun K. Richards are Lecturers, in the East Asian Languages department at the University of California, Berkeley. In 2003 Clare You was awarded the Korean National Silver Medal of Culture for her work in the advancement of Korean culture, including language texts and translations.